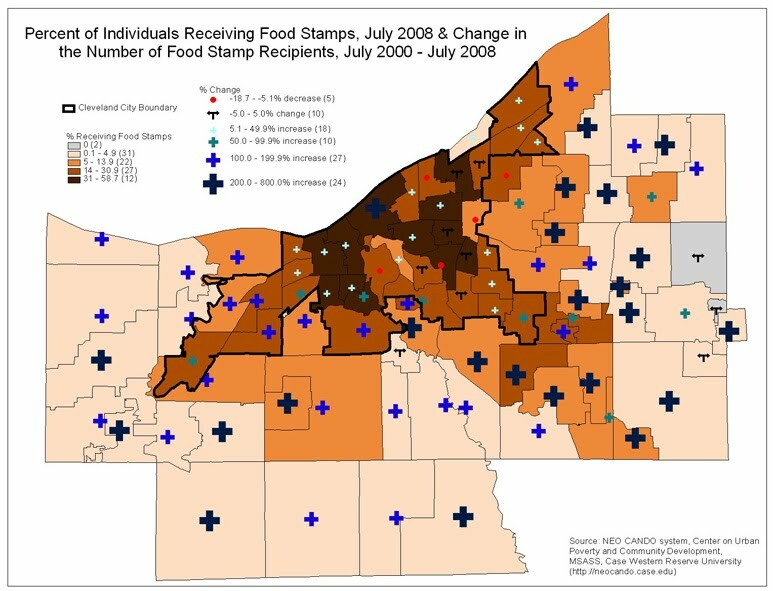 Most American cities commonly look a lot like the poverty map of Cleveland above, when it comes to the spatial distribution of poverty and affluence. There is a high-poverty core, in which residents have low income, poor health, poor education, and poor quality of life; there are rings of moderate income; and there are outer suburbs of affluent people with high quality of life. We can ask two different kinds of sociological questions about these facts: What factors cause the reproduction of disadvantage over multiple generations? And what policy interventions have some effect on enhancing upward social mobility within disadvantaged groups? How can we change this cycle of disadvantage? The persistence of inequalities in urban America was addressed in a special 2008 issue of the Boston Review in a forum on “ending urban poverty.” Particularly interesting is Patrick Sharkey’s article “The Inherited Ghetto.” Sharkey begins with a crucial and familiar point: that racial inequality has changed only very slightly since the passage of the Fair Housing Act in 1968. The concentration of black poverty in central cities has not substantially improved over that period of time, and the inequalities of health, education, and employment associated with this segregation have continued. And the association between neighborhood, degree of segregation, and income and quality of life is very strong: children born into a poor and segregated neighborhood are likely to live as adults — in a poor and segregated neighborhood. Sharkey documents these statements on the basis of his analysis of the data provided the University of Michigan Panel Study of Income Dynamics, the first major statistical study of several generations of families in terms of residence, income, occupation, health, and other important variables. Using a computer simulation based on the two-generation data provided by the Panel Study, Sharkey indicates that it would take five generations for the descendants of a family from a poor, black neighborhood to have a normal expectation of living in a typical American neighborhood. (That’s one hundred years in round numbers.) In other words: the progress towards racial equality in urban America is so slow as to be virtually undetectable. Particular frustrating is the persistence of segregation in the forty years since the passage of the Fair Housing Act. Sharkey argues that this fact is partially explained by the fact that the policy choices made by federal and local authorities concerning housing patterns have more or less deliberately favored segregation by race. Beginning with the initial Fair Housing legislation — which was enacted without giving the Federal agencies the power of enforcement — both federal and state policies have reinforced segregation in housing. Sharkey notes that federal housing programs have subsidized the growth of largely white suburbs, while redlining and other credit-related restrictions have impeded the ability of black families to follow into these new suburban communities. The continuation of informal discrimination in the housing market (as evidenced by “testers” from fair housing agencies) further reinforces continuing segregation between inner-city black population and the suburban, mostly white population. So racial segregation is one important mechanism that maintains the economic and social inequalities that our society continues to embody. How about policies that would work to speed up social progress? It is commonly agreed that improving access to higher education for disadvantaged people is the best way to speed their economic advancement. The theory is that individuals within the group will benefit from higher education by enhancing their skills and knowledge; this will give them new economic opportunities and access to higher-wage jobs; the individuals will do better economically, and their children will begin life with more economic support and a set of values that encourage education. So access to higher education ought to prove to be a virtuous circle or a positive feedback loop, leading to substantial social mobility in currently disadvantaged groups. This theory appears to be substantially true: when it is possible to prepare poor children for admission to college, their performance in college and subsequent careers is good and lays a foundation for a substantial change in quality of life for themselves and their families (link). However, most of our cities are failing abysmally in the task of preparing poor children for college. High school graduation rates are extremely low in many inner-city schools — 25-50%, and performance on verbal and math assessment tests are very low. So a very substantial number of inner-city, high-poverty children are not being given the opportunity to develop their inherent abilities in order to move ahead in our society. This is true in Detroit (link), and much the same is true in Cleveland, Oakland, Miami, Houston, New Orleans, and dozens of other cities. (Here is a survey of the issues by Charles Payne in So Much Reform, So Little Change: The Persistence of Failure in Urban Schools . And here is a striking report from 1970 prepared by the HEW Urban Education Taskforce.) High poverty and poor education go hand in hand in American cities. One important research question is whether there are behavioral or structural factors that predict or cause low performance by groups of students. Here is a fascinating graph of high school graduation rates broken down by freshman-year absenteeism (MDRC report). Important research is being done at the Center for the Social Organization of Schools at Johns Hopkins on the dropout crisis in urban schools (link). (Here is an earlier post on CSOS and its recommendations for improving dropout rates from urban high schools.) The topic is important because research findings like these may offer indications of the sorts of school reforms that are most likely to enhance school success and graduation. It is clear that finding ways of dramatically increasing the effectiveness of high-poverty schools is crucial if we are to break out of the multi-generational trap that Sharkey documents for inner-city America. Here is a specific and promising strategy that is being pursued in Detroit by the Skillman Foundation and its partners (link), based on small schools, greater contact with caring adults, and challenging academic curricula. This turn-around plan is based on a specific set of strategies for improving inner-city schools developed by the Institute for Student Achievement, and ISA provides assessment data that support the effectiveness of the plan in other cities. With support from the United Way of Southeast Michigan, several large high schools are being restructured along the design principles of the ISA model. But the reality is that this problem is immense, and a few successful experiments in school reform are unlikely to move the dial. Somehow it seems unavoidable that only a Marshall Plan for addressing urban poverty would allow us to have any real confidence in the possibility of reversing the inequalities our cities reveal. And none of our political leaders — and few of our taxpayers — seem to perceive the urgency of the problem. "Somehow it seems unavoidable that only a Marshall Plan for addressing urban poverty would allow us to have any real confidence in the possibility of reversing the inequalities our cities reveal. "Amen.